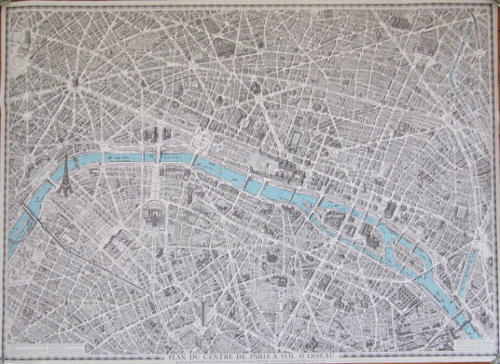 An elegant old map of paris France in very good condition and published in 1959. Incredible detail with named streets, important buildings, ie.Palaces, and rivers. A bird's eye view of central Paris produced by Blondel La Rougery (Plan du Centre de Paris - A Vol d'Oiseau). Georges Peltier painstakingly drew in elaborate detail, the aerial view of the city. His masterful creation took 30,000 hours of research and sketching over a span of 20 years (1920-1940). It is based on the famous Turgot map of Paris of 1739. This edition, published in 1986, measures 27.50" x 38" This is not a copy or scan or facsimile, but an original map produced by Blondel la Rougery. The map is a nice weight paper with a matte finish--not flimsy or glossy. It is in very good condition without stains, paper loss or holes.